Looks like Jordan Staal has impressed the Pittsburgh Penguins enough that they inked him to a contract and he will start the season in the NHL. We wish Jordan all the best but we will miss him here with the Petes. The Pittsburgh Penguins got younger on Monday. Jordan Staal will join Sidney Crosby and newly signed Kristopher Letang as the only teenagers on the Penguins’ roster when the squad opens the season Thursday against Philadelphia at Mellon Arena. 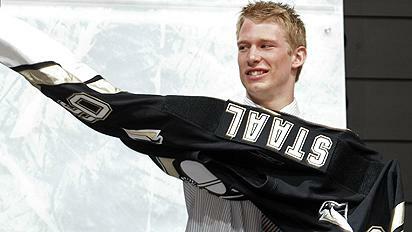 Staal, who turned 18 on Sept. 10, was the second-overall pick in this year’s NHL Entry Draft. The 6-foot-4, 215-pounder is excited to remain in Pittsburgh. "It hasn’t really sunk in yet. Come the first game, I am sure it will hit me hard," he said. "I am really excited to be a part of this team and hopefully I can be here for years to come." Staal, who had 68 points (28+40) in 68 games last season with the Peterborough Petes of the OHL, knew making the NHL roster was a long shot this season. "I don’t think any 18-year-old thinks he’s going to play in the NHL. Obviously, I’d love to be here. I am glad to be a part of this team," he said. He also knows the Penguins could return him to Peterborough before he appears in 10 NHL games. The short stint would not count toward the expiration of his NHL contract of free agency eligibility. "There is going to be a decision come game 10. It’s whether I play good enough to be here or not. We’ll wait and see," he said. "They have been pretty fair and given me the opportunity to play in different situations. I am happy with how they have treated me and I look forward to showing what I have."